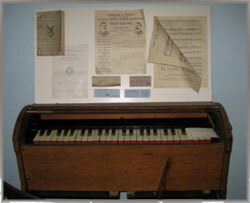 Our Main Level will feature an exhibit of ephemera from our research files. Our displays will include old menus and inn documents, medical notes and prescriptions, calling cards and more, even a presidential letter to a prominent Rockporter. 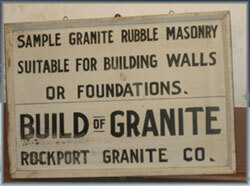 The Lower Level Granite Room is taking on a new image as ‘Rockport at Work’ showing highlights of industry in Rockport. Always included are the quarries and their workers, but now we are expanding to include fishing, farming, blacksmithing, and more. The Military Room has several displays from all of the wars including posters from the Civil War, cannon balls from the Revolutionary War and items from both World War I and II. The Children’s Room has a collection of toys, dolls, and games that children enjoyed in the past. 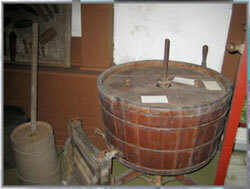 There are several dolls on display in both Museums. 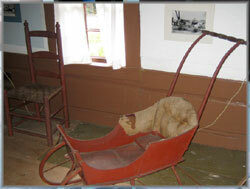 The Hannah Jumper Room and typical 1800’s bedrooms are also found on the upper level. Our extensive library is also located on the upper level. On the Main floor, in addition to the Keeping Room, Marine Room, and Main Parlor we have several original works of Art from well-known Rockport Artists. Please plan a visit to the Museum this year to view the many items found on display. There are items of interest for all age groups. 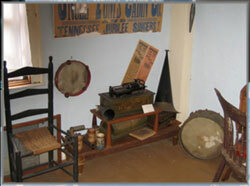 Bring your relatives and friends to the museum Encourage your friends to visit and become members of our organization. Old Castle, open for viewing on Saturday afternoons in July and August, is an old salt box house that shows much about life as it was in the Pigeon Cove section of Rockport. Below are samples from some of the Society’s most intriguing collections. Click on each to read more. © Copyright 2009-18 Sandy Bay Historical Society • All rights reserved.